Do Not Apply Paint to Trampoline Mats! Everyone knows that trampolines provide hours of jumping fun to kids and adults alike. 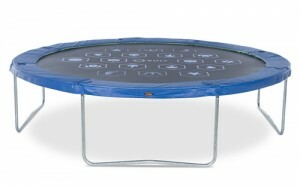 To add to the fun, many high-quality trampolines feature games or other painted novelties on the jump mat. Unfortunately, many families who want to add a creative flair to their poor quality trampolines unknowingly put the health and safety of jumpers by using spray-painting or rolling paint on the jump mat. This is highly discouraged because the paint will not adhere to the jumping mat and will instead stick to the bare feet of the jumpers. In addition to the paint sticking to the bottoms of the feet, the paint will also rub off on areas surrounding the trampoline, including the garden, home, and driveway of the property owners. It is also important to note that spray paint is not suitable for contact with skin. The skin can absorb some of the paint's chemicals, leading to health issues and feelings of sickness. Please, do not risk the health and safety of your family. If trampoline mat games are a priority, invest in a high quality trampoline from Vuly. All Vuly models feature HexVex™ mat games to add to the bouncing fun.